Full Circle Seeds is more than just a great place to buy unique, organic seeds. The company is based on a lifestyle intent on living lightly and nurturing the earth. The result is an amazing business that you can be proud to support by purchasing seeds for your garden. No matter if you prefer vegetables, herbs or flowers, the heritage varieties found here will fill your needs. This seed company was officially founded in 1993, but its history goes back much further. All of Full Circle's organic seeds are produced on ALM Organic Farm, a farm rich in history. ALM Organic Farm is located in the town of Sooke on Vancouver Island, British Columbia, Canada. Originally used in 1910 as a turnip farm, this 20 acre plot changed hands many times before being purchased by Jan and Mary Alice Johnson in 1986. It took some time to restore the original, salt-block farmhouse and get the land ready for farming again. However, in 1990 the Johnsons were able to start the commercial production of produce and in 1994 they achieved organic certification. Today the farm continues to grow organic fruits, vegetables, herbs and flowers, marketing them to restaurants and individuals. They also offer internships to those who want to learn more about organic farming and its countless benefits. Organic farming isn't the only thing taught at ALM Organic farm; volunteers are also educated in such things as animal husbandry, bread baking, bee keeping, seed saving and numerous other important skills. The Johnsons wisely started saving seeds in 1990 when they began their commercial operation. Soon they were able to offer some of these seeds to customers at local markets. From that humble beginning, they founded their seed company in 1993 and have since been selling heritage seed varieties as well as unique seeds from places like Asia and Europe. Today you can purchase in person if you a fortunate enough to live in the area, or online from the Full Circle Seeds web site. All seeds sold are certified organic and grown on ALM Organic farm. Each seed packet is intended to plant a 30 foot row and sells for $3 each. Because their seeds are open-pollinated, you $3 investment can last for generations. You are encouraged to save seeds from the plants you grow with the assurance that they will produce true to their variety year after year. This cannot be said for hybrid plant varieties. You never know what you will get planting seeds saved from hybrid fruits and vegetables. Orders can be placed online and paid with a credit card or PayPal. If you prefer, you can also mail your order along with a check or money order. 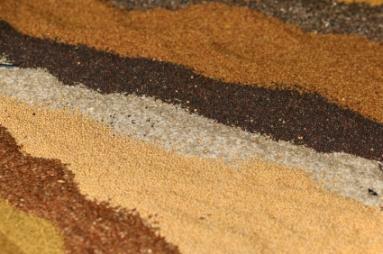 It is a good idea to call or email before placing an order to be sure the variety of seed you want is still available. This list is a small sampling of what is available. To learn more about Full Circle Seeds, ALM Organic Farm or internship opportunities, visit the web sites. Even if you never have the chance to visit personally, just reading the story behind the business is an inspiration to any gardener.